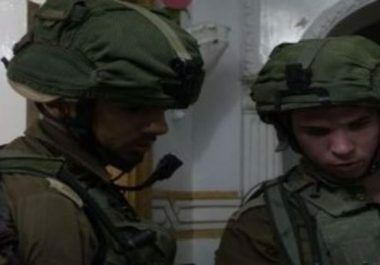 Israeli soldiers abducted, on Thursday at dawn, five Palestinians, including a physically challenged young man, after invading and searching their homes, in several parts of the occupied West Bank. The Bethlehem office of the Palestinian Prisoners’ Society (PPS) said the soldiers invaded the Deheishe refugee camp, south of the city, searched homes and abducted Omar Ali Lahham, 20, who was shot by the army in a previous invasion. It added that the soldiers also invaded homes in Husan town, west of the city, and abducted Mohammad Abdul-Rauf Abu Yabis, 18. In Ramallah, in central West Bank, the soldiers abducted Esmat Fakhri Khalifa from his home in Kafr Ni’ma town, west of the city. Furthermore, the soldiers invaded homes in Saida town, north of the northern West Bank city of Tulkarem, and abducted a former political prisoner, identified as Sameh Bilal Ajaj. The Tulkarem office of the PPS said the soldiers searched and ransacked Sameh’s home, in addition to the homes of some of his relatives, identified as Khaled Mahmoud Ajaj, Ali Azmi Ajaj, Shadi Ahmad Ajaj and Ashraf Fathi Ajaj. In Hebron, in the southern part of the West Bank, the soldiers invaded Halhoul town, north of Hebron, and abducted a physically challenged young man, identified as Abdul-Qader Akram Abu Asaba, in addition to searching the home of an elderly man, identified as Jibreel al-Jeyyawi, in Ethna town, west of the city. The soldiers also invaded and searched many homes in Yatta town, and interrogated many Palestinians, while inspecting their ID cards. In addition, the soldiers closed the main road linking Hebron with towns south of city, for the second time this week, reportedly after locating “a suspicious object,” which turned out to be an empty cardboard box. On Wednesday evening, the soldiers abducted former political prisoner, Ammar Hasan Abu Bakr, 44, at the al-Karama Border Terminal, while heading to Jordan. It is worth mentioning that Abu Bakr is a member of Fateh movement Regional Council, and the head of Jenin Chamber of Commerce. The soldiers also abducted a young Palestinian man from the al-Yamoun town, and obstructed traffic at Haifa Road, west of Jenin, and at Qabatia Junction, south of Jenin.